We just got back from a long weekend in Portland, OR and had a great time - very busy. Half the long weekend was taken up by wedding festivities and spending time with friends. The rest was ”tous les trois” with my boys. Sam is a road trip rockstar - as good as gold on the trip. 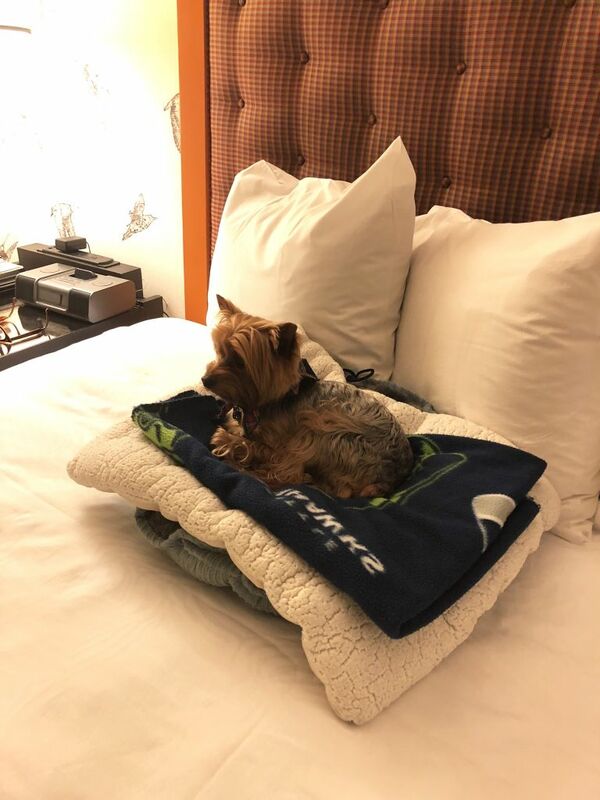 He makes himself very comfy on hotel beds - see exhibit #2. The evening wedding was STUNNING. People dressed up. I was not over dressed in the slightest - see outfit below. Weather was very mild. 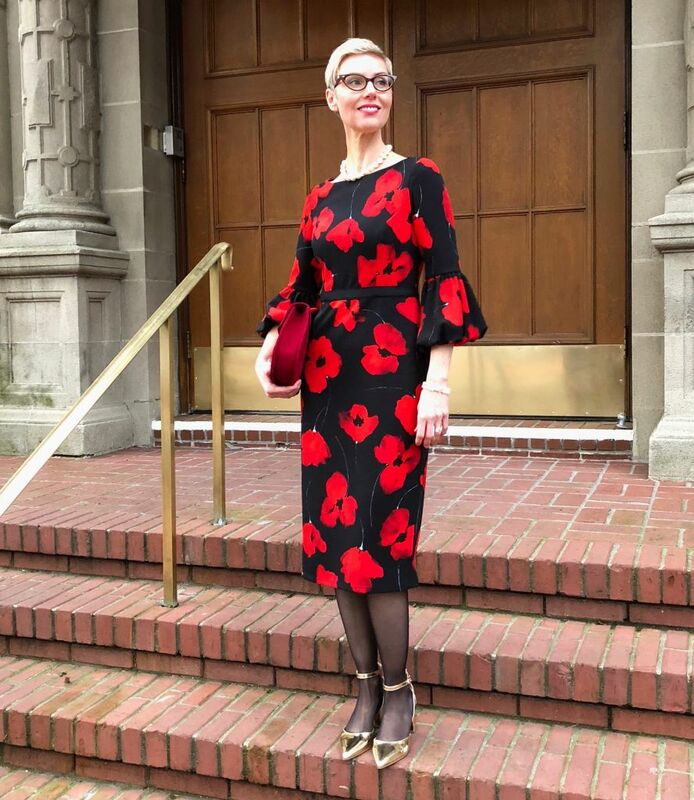 I wore my new poppy midi dress with party shoes, hose and cherry clutch. Walked back to the hotel from the venue with very happy feet. Thank you Franco Sarto! Draped my chartreuse coat over my dress. Exact items in Finds. Travel capsule in the first pic. Took me 15 mins to pull together. Worked perfectly. Grateful to be a seasoned traveler. I saw your photos on Instagram and thought you looked fabulous. I'm glad to hear you had a good time on your trip. Sam is so cute! That dress is gorgeous on you.Sam looks quite at home in his rather splendid bed,glad the weekend went well. You look wonderful, the dress is fantastic on you, lovely party shoes, everything so perfect as always. Beautiful dress Angie! Glad you enjoyed yourself. That is the best dress. Wedding guest perfect! Love Sam. He’s ready to rock n roll for this travel business! And how nice that the hotel personally welcomes dog guests. I love that! It would never happen here. Sigh. Beautiful dress , and it fits you perfectly, as one would expect . You have never looked more beautiful. What a wonderful weekend, and you look beautiful. Angie, you look beautiful and happy! Sam looks like the king of his world! Thank you ALL so much. I appreciate your kind words. You look stunning. You have packing super powers. I am struggling to pack for a quick 3day plane trip but the weather will be bitter cold and snowy, so bulky layers. Sam looks like a little prince of a pup. You look beautiful, Angie, and what a bright and happy capsule. Perfect winter pick-me-up. Plus, Sam's the boss! Gorgeous dress. Sam looks very comfy. I'm green with green coat envy. Ya look great and Sam appears to be living the dream. You look beautiful! The dog welcome board is killing me ! You look gooooorrgeous! That bold print and ladylike cut suits you perfectly. Absolutely stunning dress! 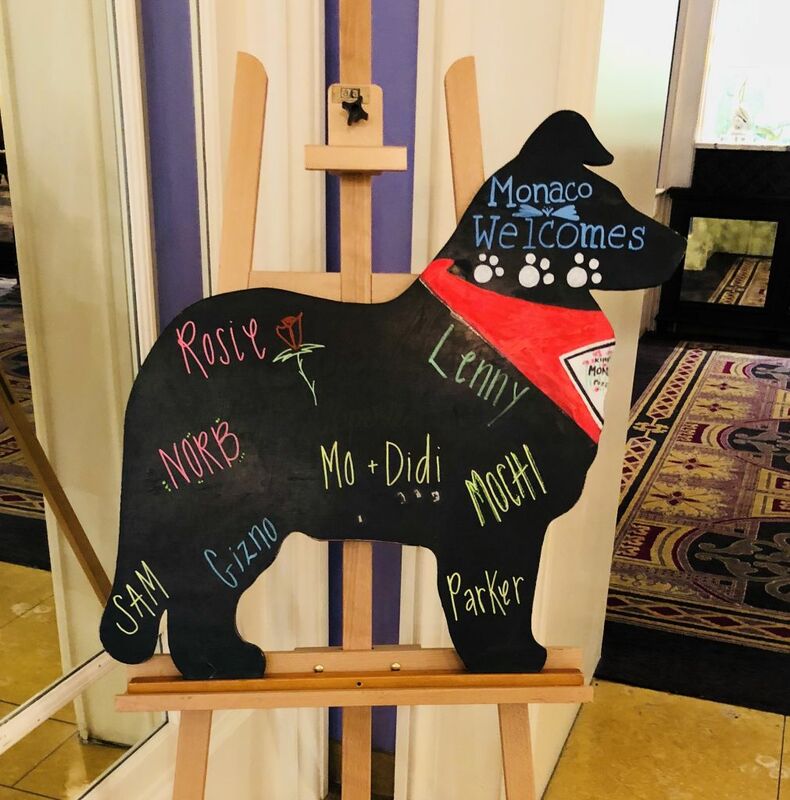 And the dog's name board is too cute! You look lovely, and Sam's a prince! Angie, you look beautiful! And I had the same thought as Jenn, that Sam is such a wee little princie! Adorable! You look very beautiful! The dress is poetry! And Sam is so cute! Beautiful! How good is Sam! Such a lovely dress and great shoes! yay, I love your candid outfit pictures. 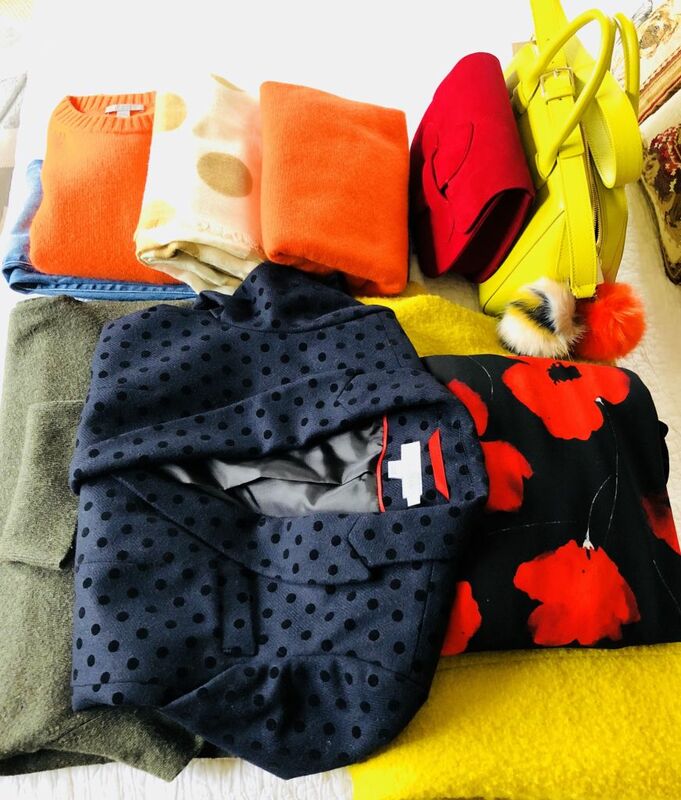 We get a glimpse into your wardrobe even if we can't get blog pictures. Thanks for indulging us. 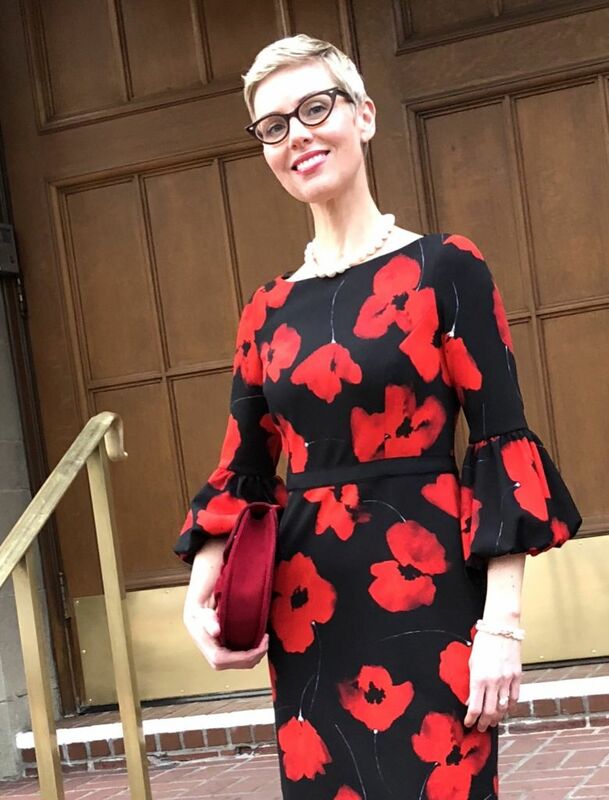 You look great for a winter wedding! You look gorgeous, Angie. Dress is beautiful, and Sam is so adorable. You look fab in that dress and Sam is too cute ! You look gorgeous in that dress! Sam is as cute as always!